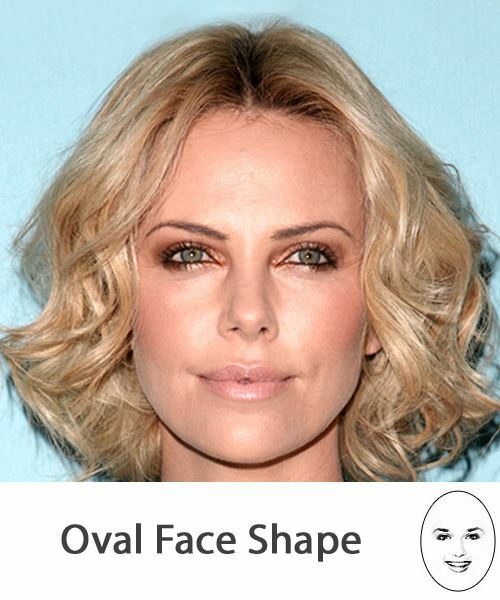 If you find that you have an oval face shape, then you're in luck! Having an oval face shape means that you can wear your hair in almost any style. Any shape and style can be worn, whether it's short, long, layered or bobbed. Or hairstyles that just cover over your beautiful face shape. 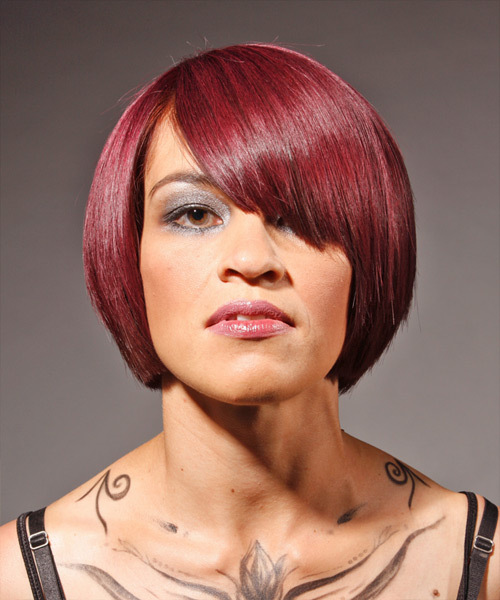 This chin length bob cut with side-swept bangs sits nicely on the models oval shape face. Although the hairstyle itself has a rounder shape, the chin area on the models face brings the style back in proportion, balancing it out rather nicely. That is the benefit of having an oval face shape! From a face shape suitability perspective, this hairstyle does nothing to show off the an oval face shape. The feathered long layers don't work and the bangs shorten the overall shape of the face making it appear much shorter than it really is. The right bangs are like the right hairstyle; they will flatter your features and look so great that you'll wonder why you didn't get them sooner. The wrong bangs, on the other hand, could leave you with a look so unflattering that any headband, hair clip or hairstyle that keeps the bangs out of the way while you grow them out quickly becomes your everyday look. Oval face shapes have the benefit of being balanced, which means that virtually any hairstyle or hair cut will work. Having said that, there are of course some hairstyles or cuts, including bangs, which can upset this balance. Bangs that are side-swept are the most flattering, but you also have to keep in mind that the bangs should not be too heavy because this can still cover up too much of your face. Soft, wispy bangs with some height. Light, side-swept bangs that will not cover up your forehead completely. Bangs that have been blunt cut and are designed to cover up a large section of your face, such as your forehead, is one such example. This will essentially cut the look of your face in half and turn your lovely oval shape into something that looks much shorter and less flattering. 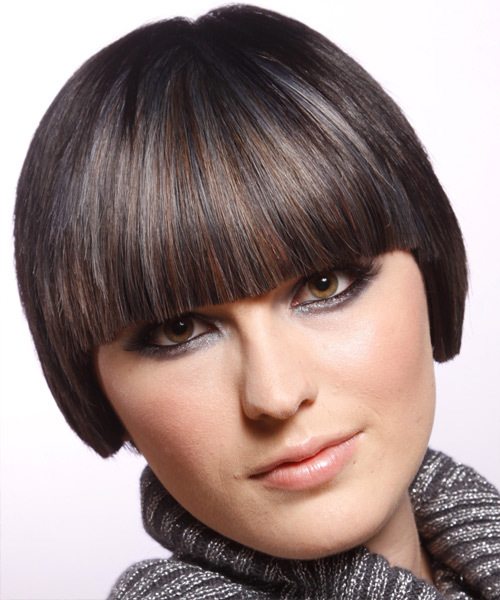 Blunt cut bangs can easily halve an oval face shape and create a less flattering shape. Bangs that are very full, heavy or hang in the face can cover up your lovely oval shape. By choosing the types of bangs that go with your oval face shape you can keep your face shape balanced and accentuate any great facial features, such as your eyes or cheekbones, so be sure to keep these choices in mind when looking for the right bangs for you. 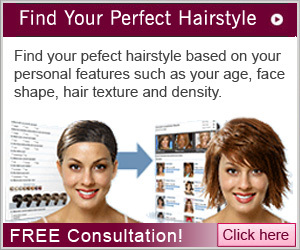 To see if these great bangs will suit you, click on the images for a link to try the virtual hairstyle on your own photo or our model. If you're after more options then here are plenty of great bangs hairstyle ideas. Using a blue kohl pencil along the edge of your eyes (above the lash line) will emphasize the size of your eyes. Now that you know your face shape and how to choose the right hairstyle, why not take a look through TheHairStyler.com's range of hairstyles for oval face shapes?